I’m slowly putting some other stuff on RedBubble as well. If there’s something you’d like to request specifically, please let me know. For Sale: Arthur Machen & HPL: Celebrate Aklo-berfest! In 1899, Welsh author Arthur Machen coined the term ‘Aklo’ (among others) in his short story The White People; years later it would be used by H. P. Lovecraft and others as well in their works. HPL used it in The Diary of Alonzo Typer, The Dunwich Horror, and The Haunter of the Dark. 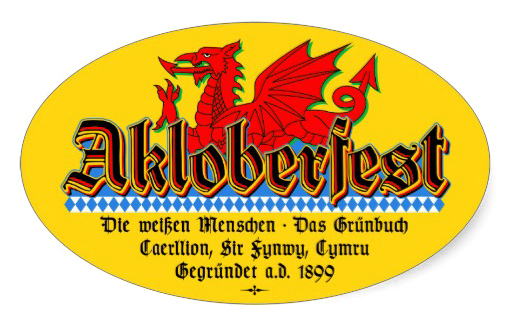 This art is my parody / mish-mash of traditional Oktoberfest and Welsh colors and motifs. The colors are inspired by traditional Oktoberfest colors (blue + white, and possibly brown and gold) and the German flag (black, red and gold (which is not accurate to 1899, but I digress)) and the colors of the Welsh flag (red, white and green (which I also don’t think existed in 1899)). The dragon is from the Welsh flag. The type is set by me in a couple of tasteful German fonts. I do prefer the ‘dark’ shirts, because the will print the white in the design, which they don’t do on the ‘light’ shirts. Anyway; your choice of some shirts and stickers. *Also, if I have butchered the Welsh, please let me know and I will correct it. 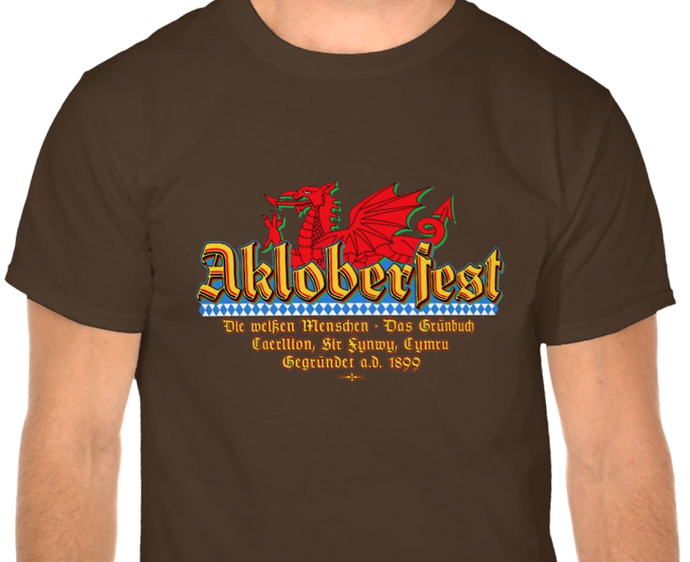 Author Staff WriterPosted on September 25, 2015 Categories DesignTags Advertisement, Aklo, arthur machen, HPL, Humor, Lovecraft, Oktoberfest, Shirt, Silliness, The Green Book, The White People, ZazzleLeave a comment on For Sale: Arthur Machen & HPL: Celebrate Aklo-berfest! Going to try to create a parody referencing something from The White People, which, while not my favorite Machen story, still has some interesting bits. And some things which were later picked up by HPL and others.